The TVR 400SE sports car was launched in 1988, and was very similar, in all respects apart from the engine, to its predecessor, the 390SE. However, one important facet was that the 400SE represented the end of the wedge shape styling, with the last of these cars being built in late 1991. It was powered by a larger Rover V8 engine, this time increased from 3905 cc to 3948 cc. It developed 275 bhp at 5500 rpm, and 270 ft/lbs of torque at 3500 rpm, which produced a top speed of 145 mph, a 0-60 mph time of 5.6 secs, and a 0-100 mph time of 14.8 secs. 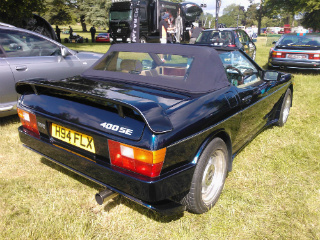 The bonnet was now vented, and a large spoiler was fitted to the rear. However, the existence of a large transmission tunnel limited space in the region of the footwell. Furthermore, the presence of a huge engine in a fibreglass body caused the interior of the cabin to remain unduly hot. However, this was more than compensated for by the scintillating acceleration and booming exhaust sound. By now, vented front disc brakes and 15 inch wheels were standard equipment, whilst power steering, initially an optional extra was, later on, a normal fitment. 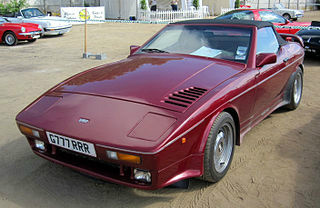 In 1989, the variant TVR 400SX was introduced as a successor to the 350SX. It featured the same engine as the 400SE, but with the addition of a Sprintex Supercharger, from DPR Racing. Although exact output figures were not available, they would likely be comparable with the 350SX, which produced an increase of 30%+ over that produced by the 350SE. The supercharged variant was noted for producing an excellent mid range power surge. It is likely, as was the case with the 350SX, that only a handful of this variant was ever built. In 1991, the TVR 430SE was unveiled at the Birmingham Motor Show of that year. 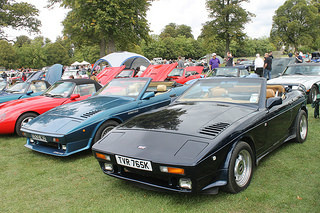 It was powered by the 4280 cc Rover V8 engine which would also used in the TVR Griffith, a model due for release in 1992. It developed 280 bhp at 5500 rpm, and 305 ft/lbs of torque at 4000 rpm. Unfortunately, no further performance figures were available. Only 3 units of the 430SE were ever built, all in 1991. Each of these variants was based on a fibreglass body fitted to a space frame chassis, in the form of a two seater convertible, and using a five speed gearbox, with four wheel independent suspension. A 1989 TVR 400SX in good condition would fetch around £15,000/$24,000, whist a 1990 400 SE in excellent condition would command in the region of £25,000/$40,000.